- Born on May 19th of 1976. - PER (Spanish sailing license). -Telecommunications Technical Engineering - Especialty Telematics with Specialization Diploma in Networks and Services awarded by Politechnic University of Mataró (EUPM); UPC center. Studies finished February 1999. - Postgrade of specialization in Technical Audit and Computer Forensics at Open University of Catalonia (UOC). Distance learning. Year 2007. - Postgrade in Oriental Asia: Japan Economy Expert, Open University of Catalonia (UOC), distance learning. Finished at 2009. - Postgrade in Integral Security Management at University of Vic & Ised center. Distance learning. Finished at 2014. - Pending final project Master in Oriental Asia: Japan Economic and Political Expert. Open University of Catalonia (UOC). Distance learning. - PCIP. PCI. Code 1002-598. 2015. Expired. - PCI SSC QSA. PCI. PCI QSA Code 203-787. 2015. Expired. - CIAM of IMI. License 3150. 2015. Expired. - ICS Security and Protection. Scadalab.eu. 2014. - ISO 27001 Lead Auditor. BSI. License ENR-00115678. 2014. - CRISC of ISACA. License 1417590. 2014. - CISM of ISACA. License 1323165. 2013. - CISA of ISACA. License 13106956. 2013. - Course of Information Security System Management based on UNE ISO IEC 27001:2005. 20 hours. Inteco. 2012. - Course of Agile development. 4 hours. Inteco. 2012. - Personal Data Privacy Course. 10 hours. Inteco. 2011. - Course of Computer Law and Judicial Assessment. Udima. 2014. - Spamina Cloud Email & Web Security Certified. Spamina . License 22102013-007. 2013. - Actic Medium level certified. January 2012. - Technical Professional: System Security (ePO4.5, VSE8.7i, HIPS7.0, FCPA). McAfee - From 2011 November 2nd until 2012 November 2nd. - Technical certified in Professional Services of ePO, VirusScan & SCM Appliance. McAfee - From 2007 May until 2008 May. - Technical Professional: Messaging and Web Security. McAfee - From 2007 April 10th until 2008 April 10th. - Technical Professional: System Security. McAfee - From 2007 April 3rd until 2008 april 3rd. - Technical certified in Professional Services. McAfee - From 2005 April 14th until 2007 March 1st. - Secure Content Manager Technical Professional. McAfee - From 2005 February 18th until 2006 February 18th. - System Security Technical Professional. McAfee - From 2005 January 14th until 2006 January 14th. - CDPP of ISMS Forum Spain. License 2017 13 0047. Year 2017. - Private Security Manager (license 12.659) & Chief (license 6.094). Spanish Home Office. 2015. - Personal Excellence Superior Program. 200 hours. E-logos & Universidad de Nebrija. 2012. - Introduction to Coaching. 25 hours. UOC. Barcelona. 2011. - Communication techniques I & II. 25 & 20 hours. FORCEM. Barcelona. 2011. - AED & BLS instructor certified by the Catalan Government. 2014. - Instrumental techniques applied (IH review). 10 hours. Red Cross. Barcelona. 2013. - Management and assistance to victims in multiple NBC situation. Merck laboratories. 2012. - Basic Occupational Health Technician. 60 hours. FORCEM. Barcelona. 2011. - Basic Life Support and Semiautomatic External Defibrillation Course. 6 hours. Subzero, validated by Semicyuc & IES (license 28515). September 2011. - Inmediate Healthcare (IH) Diploma level II. 50 hours. Red Cross. Barcelona. February 2010. Search & Rescue. License SR/0900107. - ITSM KPI Practitioner. Ozona. April 2016. - Disaster preparedness. Coursera. University of Pitssburgh. 2016. - APT. S2group. December 2015. - ITSM KPI Foundation. Ozona. October 2015. - Money laundering and terrorism financing prevention. Caja de Ingenieros. September 2015. - Terrorism and Counterterrorism: Comparing Theory and Practice. Coursera. Leiden University. 2014. - Fire Awareness Course.Chubb Parsi. December 2013. - ASITF certified. UN-DSS. May 2013. Renewed in 2016. - Special driving course - Level I. AiP. April 2009. - Grade PL-5 of Kyusho granted by (Kyusho International ®). Certificate #0064. Barcelona (Spain), November 2017. - 5th Dan of Kyusho Jutsu by Kyusho Jutsu Kokusai Shihankai. Certificate 00018. November 2017. - 2nd Dan of Ninpo Buguei (E.P.F.A.). Granada, april 2006. - 2nd Dan of Police Personal Defense. (F.A.L.M.A.). Granada, april 2006. - 1st Dan of Niten Ichi Ryu Kenjutsu. MusashiDojo. May 2018. - 1st Dan of Meifu Shinkage Ryu Shurikenjutsu. Bushi DojoBarcelona. June 2018. - 1st Dan of Ninpo Kito Ryu (Ninpo Kan Dojo Association). Barcelona. February 2001. - HEMA Medieval fencing instructor. ACEA Hall (Barcelona). From 2004 until 2007. - Kyu grade in several styles (Iaido, Budo Taijutsu, ...). - Spanish Regional Manager of Kyusho International from 2009 until 2012 (Since it was created until this role dissappeared). 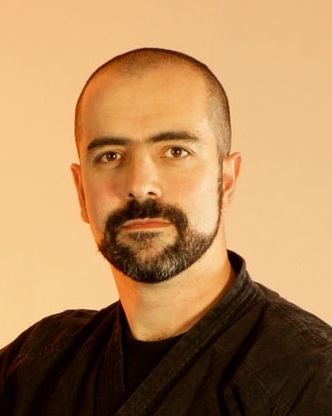 - Martial Arts judicial expert. Euroinnova (2019). - Self-Defense & Communication Systems instructor of private security. 14.364 Spanish Home Office license. February 2010. - KTCP (Kyusho Tactical Control Program) Instructor grade PL-1. License #KTCP0047. February 2014. - Martial Arts / Ninpo Buguei Instructor. (F.A.L.M.A.). April 2006. - Recognition as Researcher for the difusion and practice of Kyusho at year 2013 granted by Kyusho International®. - Recognition as Ambassador for the difusion and practice of Kyusho at year 2010 granted by Kyusho International®. -Recognition to Dedication for the difusion and practice of Kyusho at year 2008 granted by Kyusho International®. - Overall winner of the ACEA summer duels of one and a half sword. 2008 in Barberá de la Conca (Tarragona). - Therapist level 3 of the Kyusho International Health & Wellness program. License KHW0004. Weimar (Germany). November 2016. - Reiki Usui therapist. Level 3. - Teaching Martial arts since 1999. - Catalan, native language. High proficiency spoken, read and written. Level C.
- Spanish. secondary native language. High proficiency spoken, read and written. - English. Eight years of study in schools. High proficiency spoken, read and written. - Japanese. Average domain spoken, basic reading and writing. Noken Yonkyu level (2006). Departamento de Agricultura y Pesca de la Junta de Andalucía. Gestió Tributària de la Diputació de Barcelona. Institut Municipal d'Informàtica de l'Ajuntament de Barcelona. Cámara de Comercio de Madrid. Fundació Catalana per a la Recerca i Innovació. Hospital Universitari de Sant Pau. Turismo en Galícia - Turgalicia. - Member of the Security team of the IMI of the city council of Barcelona, under the guidance of Neus Bellavista, who won the SiC 2011 prize of Securmatica. 2011 April. - Member of the Computer Security Office of the IMI of the city council of Barcelona from December 2007 until June 2011. - Administrator of Kyusho Pro. - President and founder member of the A.C.D. Kyusho España association (2006). - Responsible of news & translations of PPI Coreteam from February to April of 2010. - Member of the team developing the CSA-ES certification framework. 2015. - Member of the translation team into Spanish of the "Enabling Information - COBIT5" book of ISACA. 2014. - Member of the translation team into Spanish of the "Self Assessment Guide Using Cobit 5" book of ISACA. 2015. - Adaptation of the CSA CCMv3 into the Spanish security Framcework (RD 3/2010). 2014. - Translator of several e-books from English into Spanish. (Kyusho H&W, KTCP, Hohan Noken Secret Notes). - Has participated in the documentary Indignados. Program broadcasted in Internet 2011, November 4th. - Has participated in the TV3 program Latituds - "Ciberactivistes". Program broadcasted for the first time 2011, May the 29th. - Has participated in the TV3 program Karakia "Més enllà de Gaudí - 2". For the tea ceremony realized by the master Reiko Ishimatsu. Program broadcasted for the first time 2002, September the 24th. - Collaborated on a radio program, 'Temps Lliure' in Radio Gràcia, local radio of Barcelona, ​​for just over a year in the mid-90s.